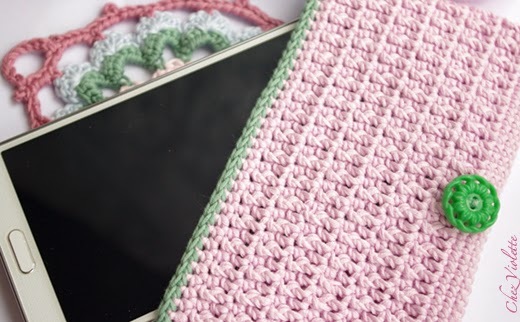 Today, I propose to make a DIY : a crochet phone case. 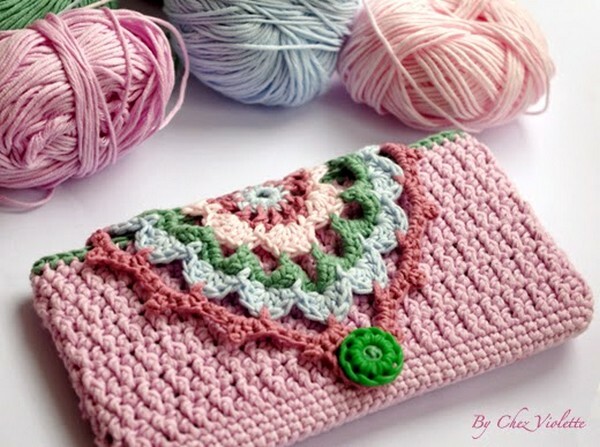 It’s a beautiful crochet phone case with nice and fresh colours, that will make your phone looks awesome! Let’s try it? ♥ cotton with 4 colors : pastel pink, dark pink, green and pastel blue. 1.1 – make a Foundation chain of lenght of your phone case. For example, for my Samsung Galaxy note 3 phone I made a Chain of 35. 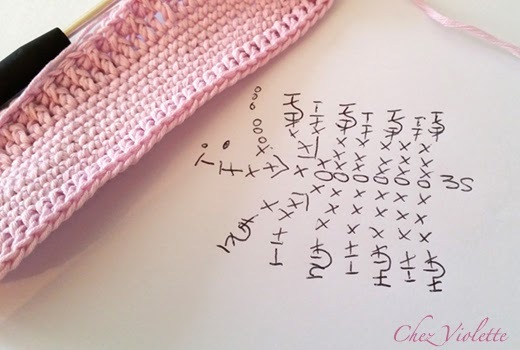 1.2 – Chain 1 and make 1 row of Single Crochet – In the last chain, make 3 Single Crochet. Then 1 row of Single Crochet in the back of the Foundation Chain. 1 slip stitch in the first Chain. 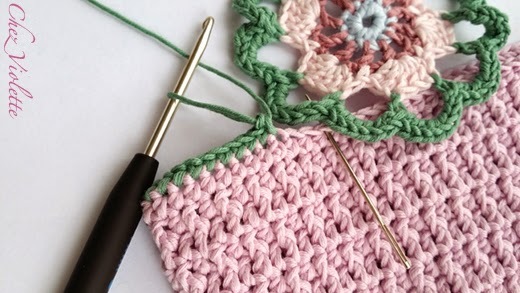 1.3 – Chain 1 and make 1 row of Single Crochet – When you arrive at the end of the row, 2 Single Crochet in each of the next 3 Chain (we turn like that) – Then 1 row of Single Crochet – 1 Slip Stitch in the first Chain. 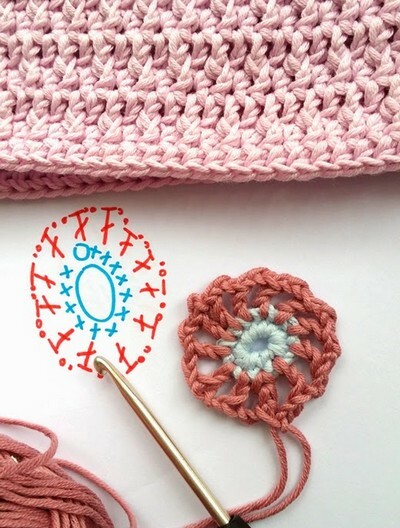 1.4 – Chain 1 – Make Single Crochet all around the Fancy Work – 1 Slip Stitch in the first Chain. 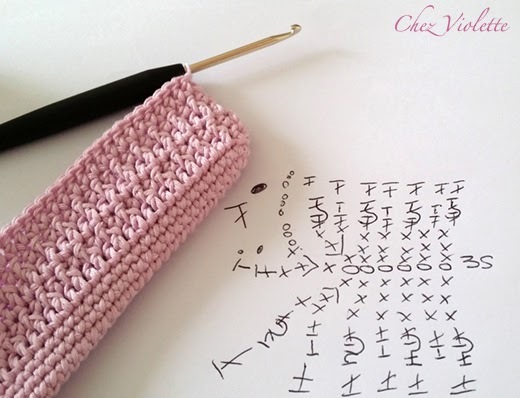 Chain 1 – Make Double Crochet all around the Fancy Work – 1 Slip Stitch in the first Chain. 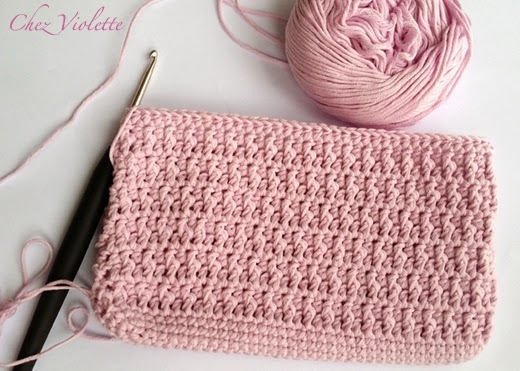 If you like, you can make you phone case just with Double Crochet. I choose to make a Fancy Stitch. 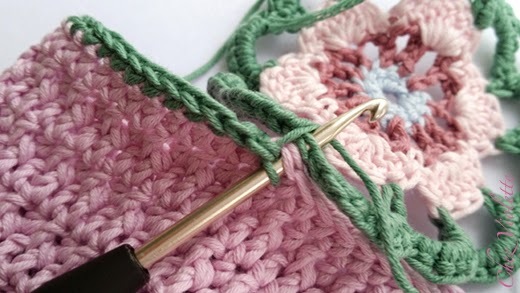 Front Post Double Crochet : instead to insert the hood in the last chain of the previous raw, you draw trough the previous row in the Double Crochet . Chain 3 – *(1 Front Post Double Crochet, 1 Single Crochet) – *all around the fancy work – 1 Slip Stitch in the first Chain. 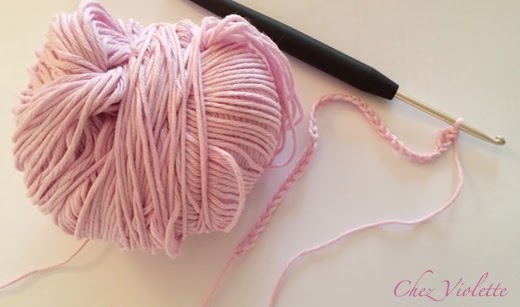 Chain 3 – Double Crochet around the fancy work – 1 Slip Stitch in the first Chain. Repeat steps 1.5 and 1.6 until you have the width of your phone. 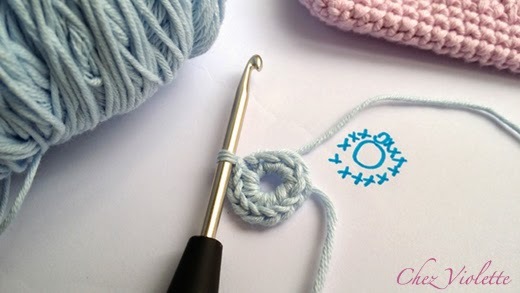 2.1 – Switch color (here Blue) – Chain 2 – In the first Chain make 12 Single Crochet. 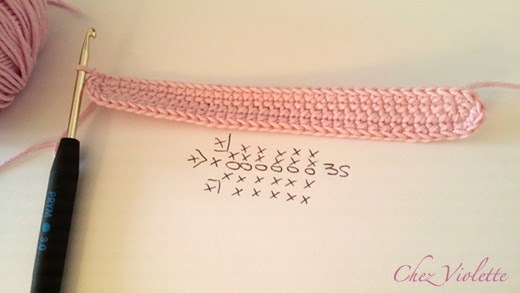 2.2 – Switch color (here Dark Pink) – Chain 5 – *(1 Double Crochet, Chain 2) in each of the 12 previous Singles Crochet. 1 Slip Stitch in the first Double Crochet. 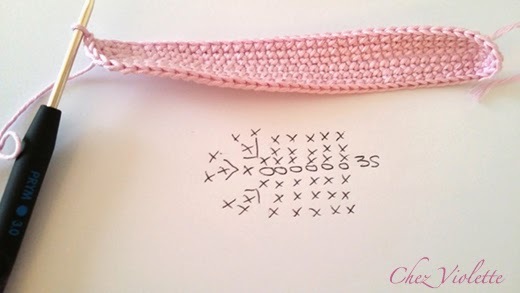 2.3 – Switch color (here pastel pink) – Chain 3, 5 Double Crochet in the Double Crochet of the previous row, 1 Single Crochet in the next Double Crochet of the previous row then *(6 Double Crochet, 1 Single Crochet) in each Double Crochet of the previous row. You will have 6 petals. 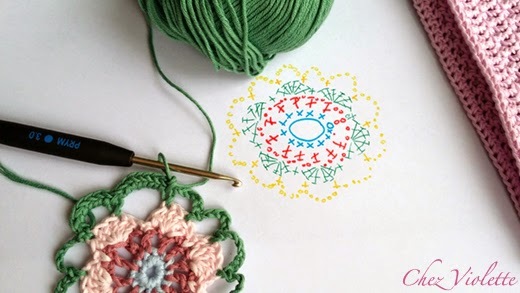 2.4 – Switch color (here Green) – *(begin on the Double Crochet number 2 of the previous petal – Chain 6 – 1 Single Crochet in the Double Crochet number 5 of the previous row) repeat * – You will have 12 Drops. 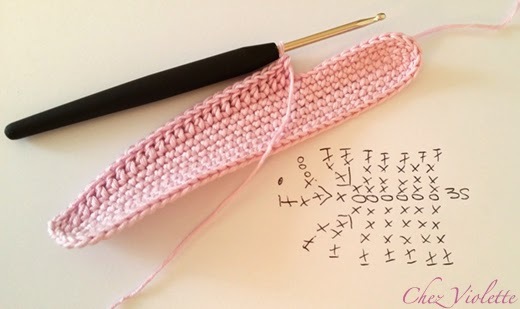 2.5 – Single Crochet in all the Chain of previous row. 3.1 – With pins, place the doily in the middle of the top of the case (here 4 drops will be attached to the case). 3.2 – Single Crochet on the case with the last used color (here green). 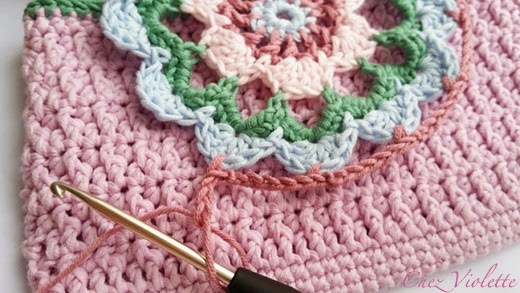 3.3 – Pass the crochet on the middle of the dolly and make Single Crochet all around the case. Finish with slip stitch on the first chain. 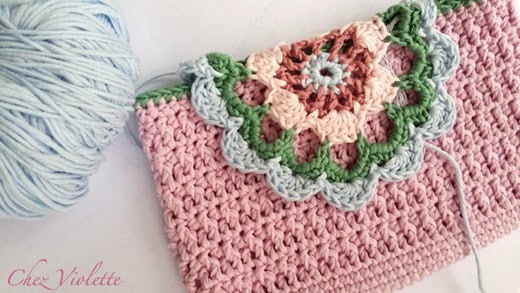 3.4 – Switch color (here Blue) – Pass your crochet on the case near the dolly, and Chain 3, 1 Slip Stitch in the middle of the drop, 5 Double Crochet, 1 Single Crochet in the end of the drop then *(6 Double Crochet, 1 Single Crochet) repeat. You will have 9 petals. 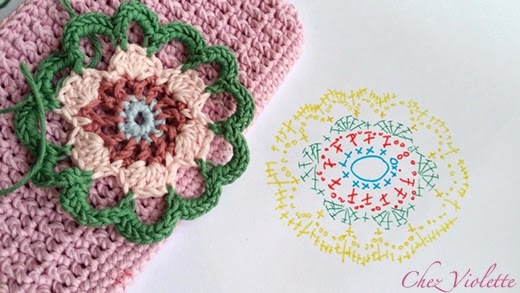 3.5 – Switch color (here Dark Pink) – Pass the crochet on the first switch of the case near the dolly, then *(Chain 6, 1 Single Crochet in the middle of the petal of the previous row) repeat. You will have 10 drops. Picot : Chain 3, slip stitch on the first chain. 3.6 – With the same color, make Single Crochet in each chain of the previous row. 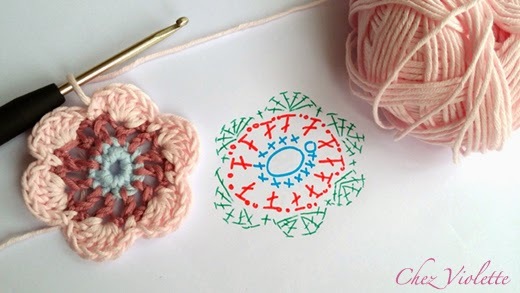 In the middle of each drop, make a picot. 3.7 – Sewing a button on the botton on your case (on the pink part) and make a chain between 2 drops to close your case.